This is probably the most affordable conveyor oven that will bake fresh dough pizzas. So if you are not using a par baked crust, we strongly recommend this oven. It will make about 16 medium pizzas in an hour. Separate top and bottom variable heat zones, and variable conveyor speed control allow you to get just the right crispness that you want. Automatic cool down feature. See this equipment in action at Quaker Steak & Lube . 19-7/8"H x 60"L. 208V 60/1 Hz. 208V is 30.3 amps, 240V is 26.3 amps. Uses a 6-30P plug. Belleco delivers energy efficiency at maximum output with minimum counter-space and energy usage. Technicians support their products 24/7, 365 days a year with an industry best 2-year warranty. 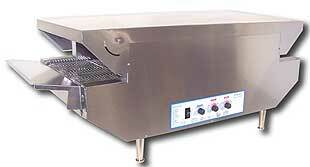 See our stainless steal table section for optional equipment that will hold this oven. It is 60 inch long so we suggest a 72 inch table or equipment stand.